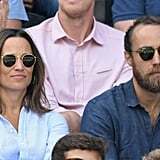 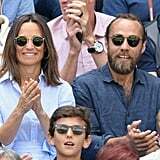 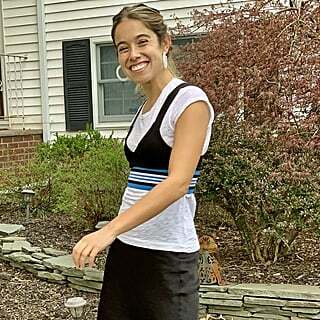 Pippa Middleton, who frequently attends Wimbledon matches, showed up with her brother James on July 11 after sporting a similar, albeit fancier outfit days before. 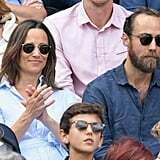 The expecting mum looked 100 times more relaxed as she breezed her way past the cameras to the stands sporting a linen Polo Ralph Lauren shirt dress (£118, originally £196) and easy black espadrilles that featured a much smaller, lightweight platform than the wedges she's worn before. 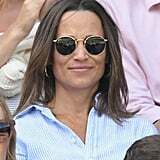 Pippa's combination is really so simple when you think about it, we're not sure why we aren't wearing these exact Summer basics right now. 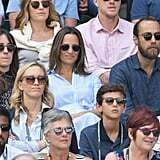 Ahead, see how the gorgeous younger sis to Kate (who owns a similar breezy dress from Zara, BTW) accessorised with a crossbody camera bag, Ray-Ban sunglasses, and gold hoops.